You know about crowdfunding, right? In a digital sense, crowdfunding is when someone raises money through social media for a cause. Kickstarter and Indiegogo are among the most popular crowdfunding sites. Typically, it’s a philanthropic cause, although a friend of mine just crowdfunded money for… a hat, which is fine, too, I guess. Now, what does crowdfunding have to do with Nikola Tesla, a scientist whose discoveries made possible everything from electricity to cell phones? Matthew Inman is the creator of the wildly popular comic site/blog, The Oatmeal. 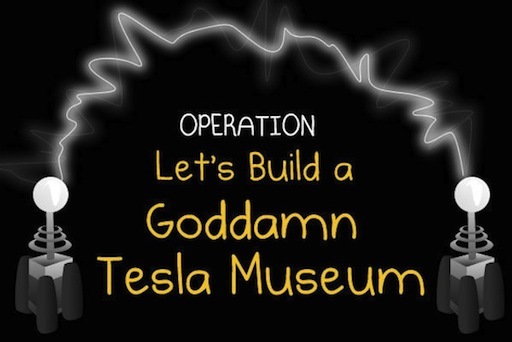 When he heard Tesla’s laboratory was in danger of being torn down and turned into a retail center, he rallied his troops and started a campaign to buy the lab and establish a museum dedicated to Tesla. Earlier today, Inman announced he’d met his goal in just six days. With still more than a month to go in the campaign, Inman has raised nearly $1 million from his loyal online fans — and that number continues to grow by the hour. Along with a matching grant from New York state, Inman has single-handedly saved an important piece of science history. Next Next post: Cat videos or U.S. election coverage? You choose on YouTube.